The Antique Ring is a fanciful story-within-a-story, a legend about the ring composed by an aspiring author/lawyer as a prize for his fiance. It was published in Hawthorne's collection, The Dolliver Romance and Other Pieces (1876). Now such a task—and doubtless Clara knew it—was the most acceptable that could have been imposed on Edward Caryl. He was one of that multitude of young gentlemen—limbs, or rather twigs of the law—whose names appear in gilt letters on the front of Tudor’s Buildings, and other places in the vicinity of the Court House, which seem to be the haunt of the gentler as well as the severer Muses. Edward, in the dearth of clients, was accustomed to employ his much leisure in assisting the growth of American Literature, to which good cause he had contributed not a few quires of the finest letter-paper, containing some thought, some fancy, some depth of feeling, together with a young writer’s abundance of conceits. Sonnets, stanzas of Tennysonian sweetness, tales imbued with German mysticism, versions from Jean Paul, criticisms of the old English poets, and essays smacking of Dialistic philosophy, were among his multifarious productions. The editors of the fashionable periodicals were familiar with his autograph, and inscribed his name in those brilliant bead-rolls of ink-stained celebrity, which illustrate the first page of their covers. Nor did fame withhold her laurel. Hillard had included him among the lights of the New England metropolis, in his Boston Book; Bryant had found room for some of his stanzas, in the Selections from American Poetry; and Mr. Griswold, in his recent assemblage of the sons and daughters of song, had introduced Edward Caryl into the inner court of the temple, among his fourscore choicest bards. There was a prospect, indeed, of his assuming a still higher and more independent position. Interviews had been held with Ticknor, and a correspondence with the Harpers, respecting a proposed volume, chiefly to consist of Mr. Caryl’s fugitive pieces in the Magazines, but to be accompanied with a poem of some length, never before published. Not improbably, the public may yet be gratified with this collection. Meanwhile, we sum up our sketch of Edward Caryl, by pronouncing him, though somewhat of a carpet knight in literature, yet no unfavorable specimen of a generation of rising writers, whose spirit is such that we may reasonably expect creditable attempts from all, and good and beautiful results from some. And, it will be observed, Edward was the very man to write pretty legends, at a lady’s instance, for an old-fashioned diamond ring. He took the jewel in his hand, and turned it so as to catch its scintillating radiance, as if hoping, in accordance with Clara’s suggestion, to light up his fancy with that starlike gleam. The young gentleman promised obedience; and going to his pillow, with his head full of the familiar spirits that used to be worn in rings, watches, and sword-hilts, he had the good fortune to possess himself of an available idea in a dream. Connecting this with what he himself chanced to know of the ring’s real history, his task was done. Clara Pemberton invited a select few of her friends, all holding the stanchest faith in Edward’s genius, and therefore the most genial auditors, if not altogether the fairest critics, that a writer could possibly desire. Blessed be woman for her faculty of admiration, and especially for her tendency to admire with her heart, when man, at most, grants merely a cold approval with his mind! 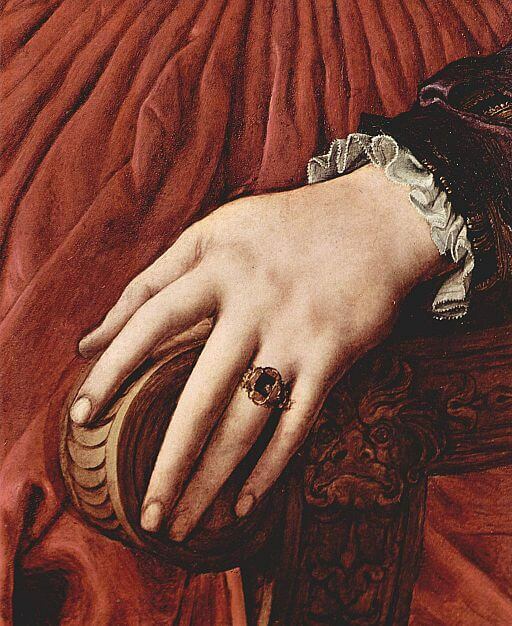 After the death-warrant had been read to the Earl of Essex, and on the evening before his appointed execution, the Countess of Shrewsbury paid his lordship a visit, and found him, as it appeared, toying childishly with a ring. The diamond, that enriched it, glittered like a little star, but with a singular tinge of red. The gloomy prison-chamber in the Tower, with its deep and narrow windows piercing the walls of stone, was now all that the earl possessed of worldly prospect; so that there was the less wonder that he should look steadfastly into the gem, and moralize upon earth’s deceitful splendor, as men in darkness and ruin seldom fail to do. But the shrewd observations of the countess,—an artful and unprincipled woman,—the pretended friend of Essex, but who had come to glut her revenge for a deed of scorn which he himself had forgotten,—her keen eye detected a deeper interest attached to this jewel. Even while expressing his gratitude for her remembrance of a ruined favorite, and condemned criminal, the earl’s glance reverted to the ring, as if all that remained of time and its affairs were collected within that small golden circlet. “An idle legend!” said the countess. Nevertheless, the earl’s manner testified how slight was his credence in the enchanted properties of the ring. But there is a kind of playfulness that comes in moments of despair, when the reality of misfortune, if entirely felt, would crush the soul at once. He now, for a brief space, was lost in thought, while the countess contemplated him with malignant satisfaction. “Yet it is your only hope,” said the countess. But still Essex gazed at the ring with an absorbed attention, that proved how much hope his sanguine temperament had concentrated here, when there was none else for him in the wide world, save what lay in the compass of that hoop of gold. The spark of brightness within the diamond, which gleamed like an intenser than earthly fire, was the memorial of his dazzling career. It had not paled with the waning sunshine of his mistress’s favor; on the contrary, in spite of its remarkable tinge of dusky red, he fancied that it never shone so brightly. The glow of festal torches,—the blaze of perfumed lamps,—bonfires that had been kindled for him, when he was the darling of the people,—the splendor of the royal court, where he had been the peculiar star,—all seemed to have collected their moral or material glory into the gem, and to burn with a radiance caught from the future, as well as gathered from the past. That radiance might break forth again. Bursting from the diamond, into which it was now narrowed, it might been first upon the gloomy walls of the Tower,—then wider, wider, wider,—till all England, and the seas around her cliffs, should be gladdened with the light. It was such an ecstasy as often ensues after long depression, and has been supposed to precede the circumstances of darkest fate that may befall mortal man. The earl pressed the ring to his heart as if it were indeed a talisman, the habitation of a spirit, as the queen had playfully assured him,—but a spirit of happier influences than her legend spake of. But then occurred the recollection of the impossibility of obtaining an interview with his fatally estranged mistress, and testing the influence over her affections, which he still flattered himself with possessing. Could he step beyond the limits of his prison, the world would be all sunshine; but here was only gloom and death. The Countess of Shrewsbury, herself forgotten amid the earl’s gorgeous visions, had watched him with an aspect that could have betrayed nothing to the most suspicious observer; unless that it was too calm for humanity, while witnessing the flutterings, as it were, of a generous heart in the death-agony. She now approached him. The earl’s first impulse was to hold out the ring. But looking at the countess, as she bent forward to receive it, he fancied that the red glow of the gem tinged all her face, and gave it an ominous expression. Many passages of past times recurred to his memory. A preternatural insight, perchance caught from approaching death, threw its momentary gleam, as from a meteor, all round his position. “Take the ring,” said the earl. She departed. Again the earl’s hopes rose high. Dreams visited his slumber, not of the sable-decked scaffold in the Tower-yard, but of canopies of state, obsequious courtiers, pomp, splendor, the smile of the once more gracious queen, and a light beaming from the magic gem, which illuminated his whole future. History records how foully the Countess of Shrewsbury betrayed the trust, which Essex, in his utmost need, confided to her. She kept the ring, and stood in the presence of Elizabeth, that night, without one attempt to soften her stern hereditary temper in behalf of the former favorite. The next day the earl’s noble head rolled upon the scaffold. On her death-bed, tortured, at last, with a sense of the dreadful guilt which she had taken upon her soul, the wicked countess sent for Elizabeth, revealed the story of the ring, and besought forgiveness for her treachery. But the queen, still obdurate, even while remorse for past obduracy was tugging at her heart-strings, shook the dying woman in her bed, as if struggling with death for the privilege of wreaking her revenge and spite. The spirit of the countess passed away, to undergo the justice, or receive the mercy, of a higher tribunal; and tradition says, that the fatal ring was found upon her breast, where it had imprinted a dark red circle, resembling the effect of the intensest heat. The attendants, who prepared the body for burial, shuddered, whispering one to another, that the ring must have derived its heat from the glow of infernal fire. They left it on her breast, in the coffin, and it went with that guilty woman to the tomb. Many years afterward, when the church, that contained the monuments of the Shrewsbury family, was desecrated by Cromwell’s soldiers, they broke open the ancestral vaults, and stole whatever was valuable from the noble personages who reposed there. Merlin’s antique ring passed into the possession of a stout sergeant of the Ironsides, who thus became subject to the influences of the evil spirit that still kept his abode within the gem’s enchanted depths. The sergeant was soon slain in battle, thus transmitting the ring, though without any legal form of testament, to a gay cavalier, who forthwith pawned it, and expended the money in liquor, which speedily brought him to the grave. We next catch the sparkle of the magic diamond at various epochs of the merry reign of Charles the Second. But its sinister fortune still attended it. From whatever hand this ring of portent came, and whatever finger it encircled, ever it was the pledge of deceit between man and man, or man and woman, of faithless vows, and unhallowed passion; and whether to lords and ladies, or to village-maids,—for sometimes it found its way so low,—still it brought nothing but sorrow and disgrace. No purifying deed was done, to drive the fiend from his bright home in this little star. Again, we hear of it at a later period, when Sir Robert Walpole bestowed the ring, among far richer jewels, on the lady of a British legislator, whose political honor he wished to undermine. Many a dismal and unhappy tale might be wrought out of its other adventures. All this while, its ominous tinge of dusky red had been deepening and darkening, until, if laid upon white paper, it cast the mingled hue of night and blood, strangely illuminated with scintillating light, in a circle round about. But this peculiarity only made it the more valuable. Alas, the fatal ring! When shall its dark secret be discovered, and the doom of ill, inherited from one possessor to another, be finally revoked? The legend now crosses the Atlantic, and comes down to our own immediate time. In a certain church of our city, not many evenings ago, there was a contribution for a charitable object. A fervid preacher had poured out his whole soul in a rich and tender discourse, which had at least excited the tears, and perhaps the more effectual sympathy, of a numerous audience. While the choristers sang sweetly, and the organ poured forth its melodious thunder, the deacons passed up and down the aisles, and along the galleries, presenting their mahogany boxes, in which each person deposited whatever sum he deemed it safe to lend to the Lord, in aid of human wretchedness. Charity became audible,—chink, chink, chink,—as it fell, drop by drop, into the common receptacle. There was a hum,—a stir,—the subdued bustle of people putting their hands into their pockets; while, ever and anon, a vagrant coin fell upon the floor, and rolled away, with long reverberation, into some inscrutable corner. At length, all having been favored with an opportunity to be generous, the two deacons placed their boxes on the communion-table, and thence, at the conclusion of the services, removed them into the vestry. Here these good old gentlemen sat down together, to reckon the accumulated treasure. They now proceeded to sum up the avails of the evening, beginning with the receipts of Deacon Trott. In good sooth, that worthy personage had reaped an abundant harvest, in which he prided himself no less, apparently, than if every dollar had been contributed from his own individual pocket. Had the good deacon been meditating a jaunt to Texas, the treasures of the mahogany box might have sent him on his way rejoicing. There were bank-notes, mostly, it is true, of the smallest denominations in the giver’s pocket-book, yet making a goodly average upon the whole. The most splendid contribution was a check for a hundred dollars, bearing the name of a distinguished merchant, whose liberality was duly celebrated in the newspapers of the next day. No less than seven half-eagles, together with an English sovereign, glittered amidst an indiscriminate heap of silver; the box being polluted with nothing of the copper kind, except a single bright new cent, wherewith a little boy had performed his first charitable act. “Very well! very well indeed!” said Deacon Trott, self-approvingly. “A handsome evening’s work! And now, Brother Tilton, let’s see whether you can match it.” Here was a sad contrast! They poured forth Deacon Tilton’s treasure upon the table, and it really seemed as if the whole copper coinage of the country, together with an amazing quantity of shop-keeper’s tokens, and English and Irish half-pence, mostly of base metal, had been congregated into the box. There was a very substantial pencil-case, and the semblance of a shilling; but he latter proved to be made of tin, and the former of German-silver. A gilded brass button was doing duty as a gold coin, and a folded shopbill had assumed the character of a bank-note. But Deacon Tilton’s feelings were much revived by the aspect of another bank-note, new and crisp, adorned with beautiful engravings, and stamped with the indubitable word, TWENTY, in large black letters. Alas! it was a counterfeit. In short, the poor old Deacon was no less unfortunate than those who trade with fairies, and whose gains are sure to be transformed into dried leaves, pebbles, and other valuables of that kind. “I believe the Evil One is in the box,” said he, with some vexation. Under the copper mountain, which it had cost them so much toil to remove, lay an antique ring! It was enriched with a diamond, which, so soon as it caught the light, began to twinkle and glimmer, emitting the whitest and purest lustre that could possibly be conceived.—It was as brilliant as if some magician had condensed the brightest star in heaven into a compass fit to be set in a ring, for a lady’s delicate finger. It has been our good luck to recover a portion of that history. After transmitting misfortune from one possessor to another, ever since the days of British Merlin, the identical ring which Queen Elizabeth gave to the Earl of Essex was finally thrown into the contribution-box of a New England church. The two deacons deposited it in the glass case of a fashionable jeweller, of whom it was purchased by the humble rehearser of this legend, in the hope that it may be allowed to sparkle on a fair lady’s finger. Purified from the foul fiend, so long its inhabitant, by a deed of unostentatious charity, and now made the symbol of faithful and devoted love, the gentle bosom of its new possessor need fear no sorrow from its influence. Very pretty!—Beautiful!—How original!—How sweetly written!—What nature!—What imagination!—What power!—What pathos!—What exquisite humor!”—were the exclamations of Edward Caryl’s kind and generous auditors, at the conclusion of the legend. Add The Antique Ring to your own personal library.